A few cool things to squeeze in before we roll out the advent calendars. 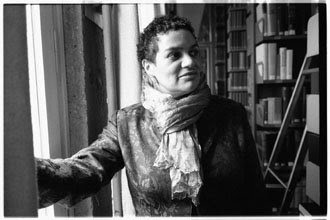 Jackie Kay has written seven new songs on the theme of HIV, and seven different composers (David Horne, Bechara el Khoury, Colin Matthews, Craig Urquhart, Niel van der Watt, Errollyn Wallen and Marc Yeats) have composed music to go with them. The result is a secular requiem called "Walking along the red-dust road," which will premiere at the Bridgewater Hall at 8pm on Dec. 1, World Aids Day. Mark Elder and the Halle will also perform Faure's Requiem, one of my most favourite pieces of music ever. And tickets will raise money for international charity ActionAid's Mission Malawi. Tickets: £15/ £25 from The Bridgewater Hall Box Office, 0161 907 9000 or online here. Those crafty Islington Mill folk have put together a smorgasboard of christmas present possibilities at an impromptu shop at 142 Chapel Street, near Salford central train station. 'FROM SPACE' is a temporary art and fashion store selling one off pieces made at t'mill and further afield. Products on sale including fashion, accessories, clothing and t-shirts, large scale photographs, handmade clothes, ceramics, fine art prints, hand-crafted furniture, etc. Go between 3-7 for the launch this Thursday and you might get some mulled wine or something. Also, the craft and design centre is packed to the rafters with gorgeousness this year. And the cafe there is making some tasty sandwiches. They're having Sunday shopping launch day from 1-4 this weekend. Go for a 10 percent discount, music from Manchester Community Choir and Dr Butlers Hatstand Medicine Band, and the obligatory mulled wine. The Northern Quarter has a brand spanking new pizza place on High Street: Dough. Haven't been yet but planning on making a trip soon; a family-friendly place for chow in the area is much needed. There's a pharmacy-themed bar next door called Apotheca as well. And last but not least, Social Media Cafe Manchester has gotten off to a strong start. I couldn't make last month's inaugural event but I hear it was overrun with people merrily tweeting, yelping, blogging and pinging. If you know what those things are or do them yourself you might want to head to the next one, which is Monday 8th December - 6pm to 9pm at The Northern. FACT curator Heather Corcoran will be the guest speaker. For future reference, Social Media cafe lives here.